Icebergs are much like clouds. They form all shapes and sizes, with a multitude of colours and textures. They are dynamic, constantly shifting, and drifting with the prevailing currents and winds. Some days there are lots and other days there are few. The regions where icebergs form are some of the most awe-inspiring environments on the planet, but are undergoing rapid changes. Recently, I was fortunate enough to witness this up close on a kayaking trip, touring some fjords of southern Greenland. As you sit and stare at the glacier front, there is a real sense of calm and wonder. The only sounds are the lapping waves against your kayak, and the regular shifting of the glacier, which sounds exactly like a rumble of thunder. You dare not stray too close, due to the risk of a large chunk of ice calving off the front, and likely capsising you into the ice cold waters. But it is hard to resist edging nearer to see more and more detail of the ice as it reaches into the water. It is entirely normal for glaciers to move and produce icebergs, but it is also easy to see the dramatic changes that this region is undergoing. There are swathes of bare rock, uncovered by melting ice and yet to regrow vegetation. In the distance there are new mountains sticking out above the ice cap (nunataks) – until recently they were buried below the ice. And, most vividly, the glacier fronts are retreating rapidly. 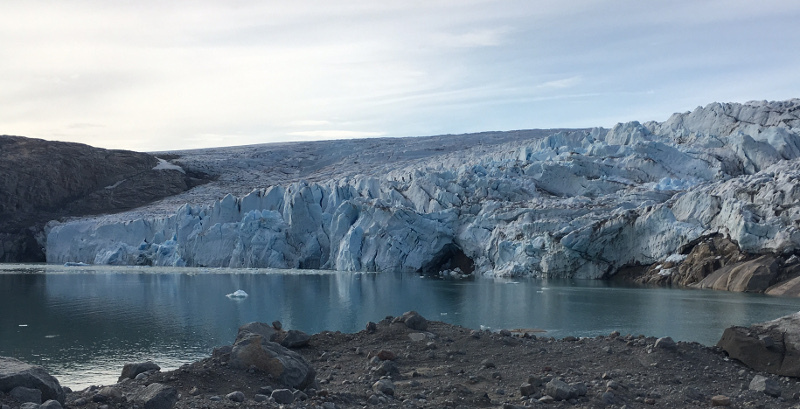 At the Qalerallit Sermia glacier front, the last four years have seen rapid retreat. This year, a new island had even emerged in the fjord which we could land and sit on to watch the glacier. The Qalerallit Sermia glacier front retreating over the past four years, with 2017 at the bottom. 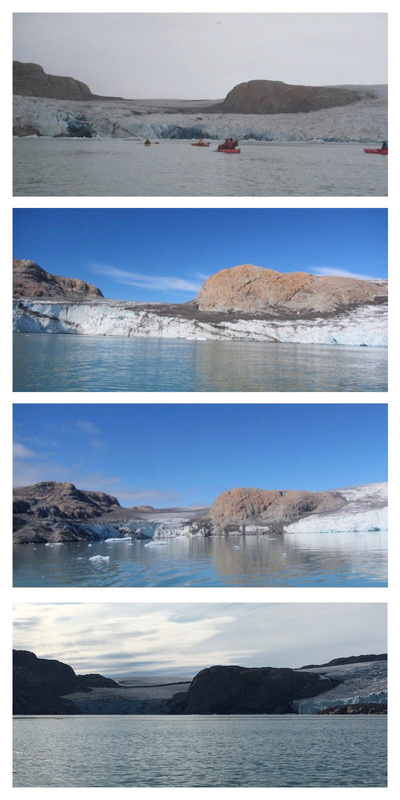 In 2014 (top), it was one wide glacier front – now it is three separate fronts. The maps of the area are also out of date. The map below (printed in 2008) shows the glacier as a single front, several kilometres further towards the sea than the reality in 2017. 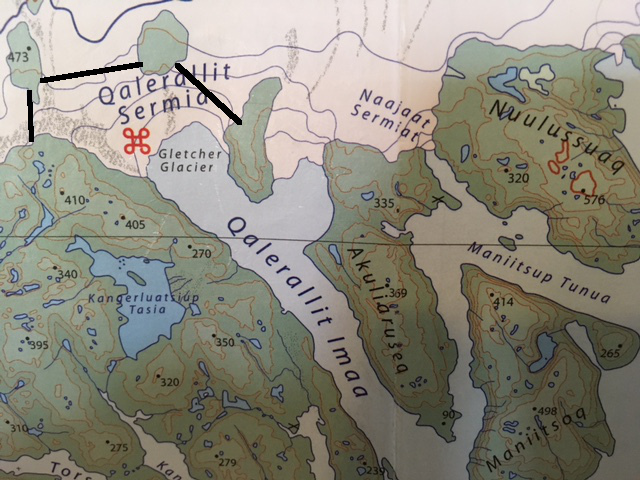 Map of the Qalerallit Sermia glacier printed in 2008, and with approximate 2017 glacier front marked in black. The glacier front has retreated 3-5km from the mapped position, although it is not clear whether the mapping was done in 2008 or earlier. This is just one small region, but the effects of warming global temperatures are obvious. The natural world is responding to the relatively mild temperature rise already seen and will continue to adjust as temperatures continue to rise, changing the climate of the fjords, affecting the local wildlife, contributing to rising sea levels and amplifying the warming as the reflective ice melts to leave dark rock underneath. There can be no doubt that this region is getting warmer. It is disheartening, but I think important, to see these changes occurring with our own eyes. Hopefully this will enable me to communicate the ongoing changes more visually and vividly in future. the idea is that a statistical artefact (technical term the climate scientist use) could arise if there is a change of recording methods. Pre mid 70s there was a very inacurate data set. records were taken from various sources, some usefull some not. Each set of data had to be modified to allow for inaccuracy. This was a process of averaging. Also when the data sets are brought together they are also averaged. Averaging is the correct scientific thing to do, I have no complaints here. but averaging creates a smooth graph and removes the extreme peeks and troughs. As we are looking for such extremes to back the man made model, this is significant. So then why did everything change around 1975? ( this is the date that the sudden and prolonged rise in temperature began). My idea is that this was when the weather buoys were stationed around the earth by the military. The unintended consequence of these sophisticated and acurate temperature measuring devices is that climatalogist suddenly had accurate infomation. because it was acurate they could now reduce the amount tehy needed to average. This will create a truer depiction of the natural climate , which is far more extreme than we think. Extremes of temperature on both the large and small scale are the norm for earth, we probably have done little to affect it. I am happy to stop any destruction of the planet, but this obsession with carbon may be missing the real culprets. Soya plantations in place of native forests may be the worst man made destruction for example, or some other atrocity of this stupid human race.